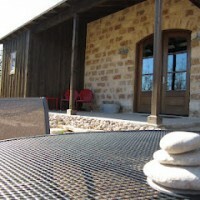 We really don’t want to refer to Double Deer Ranch as cabins nor cottages; they are beautiful limestone buildings. The property is located only about 5 miles North of theMain Street, yet you feel miles away because of the R and R that you immediately feel here. There are three buildings all spaced out on the property giving each home a sense of privacy. In fact, writing about the property as whole really isn’t fair because each one offers a little bit of a different style and all are top of the line luxury. 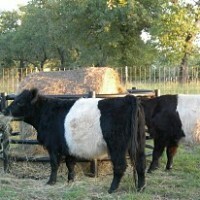 The homes sit on a working ranch with Belted Galloway cattle, which remind me of Oreo cookies. There are also two creeks that run through the property and plenty of other wildlife to add to the adventure. 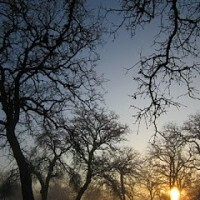 In general, it is total beauty, tranquility, and serenity. Don’t even get me started in on the massaging river stone floor in the showers. 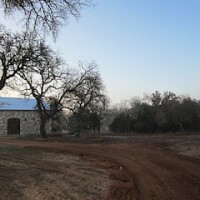 Coyote is the first house as you enter the Double Deer Ranch. With the masculine yet modern style you really feel like you have hit the jackpot for those of you who like to have the best of both worlds. The neatest treasure is the guitar collection they have imaginatively placed inside. 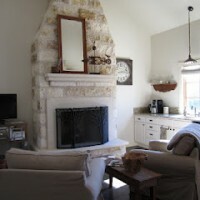 I am always a big fan of double sided fireplaces so when I saw the fireplace can be enjoyed from both the living room/bedroom or sitting in the whirlpool tub in the bathroom, you know I was in awe. 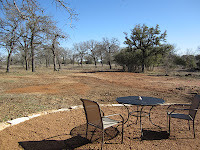 The next one is the Paloma which has a front and back porch to enjoy the different ambiance of the ranch such as the two creeks and the deer. The whirlpool tub for two is placed right in front of this massive window that allows for you to relax in the tub while enjoying the views of the countryside and one of the creeks. The last, but certainly not the least, is the Twig. This is the largest of all three and has an enormous hand carved king bed. The most awe-inspiring of all is the fabulous chandelier made of…get this…TWIGS! 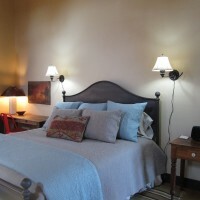 The owners truly have thought of every little detail from king beds, custom tiled bathrooms with whirlpool tubs, wood burning fireplaces, and even outdoor rockers to enjoy the splendid scenery. They have made sure that guests will endure something special in each house while still offering you luxury and decorations at their finest. We are so honored to be the “property of the week.” We’ve been working on this place for quite some time and are so excited to be open! We can’t wait until the trees leaf out and the grass turns green again. We plan to continue to add finishing touches over the next few months. Aren’t the oreo cookie cows the cutest?! Thank you so much for your awesome write up, Rachel!